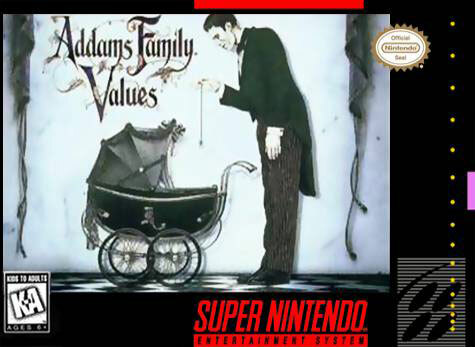 Based from the movie, Addams Family Values for Super Nintendo has the Addams back again and this time involving Baby Pubert, the newest family member. Play as Uncle Fester as you rescue Pubert from his kidnapper/former nanny! Throughout the game, you will encounter Morticia, Gomez, and Lurch as you look for clues and fight off enemies. Addams Family Values includes 42 levels to challenge your gaming skills and tons of weapons to help you along the way.